For the thinkers and theologians: What if you could know the most important theologian in evangelical history? Or as a pastor or parachurch leader, what if you could know the most important pastor in American history? Now, at least in some way, you can. Owen Strachan, PhD student at Trinity and professor at Boice College, and Edwards scholar Doug Sweeney have released a five book set called The Essential Edwards Collection. Pastors and lay persons alike are privileged to have this perfect introduction to one of the most influential minds in all of history and a clear window into the heart of a man who deeply loved God and sought to enjoy Him in all aspects of life. From Tuesday, July 27th until August 2nd, Westminster Books is offering a discount of 50% off the cover price ($44.95), making them $22.50, which is equivalent to getting one book free at the current Amazon price. Many people don't know this, but Jonathan Edwards did not become a Christian until late into his teen years. Scholars note that although he grew up in the Puritan era, exposed to the church and the gospel of Christ, it was not until age 19 before he had "a sense of the glory of the divine being" while reading 1 Tim. 1:17 over and over again. Though brilliant beyond his years, Edwards still grappled with many of the same struggles of teenagers these days. Yet when convicted so deeply of his own sin and the magnificent beauty of God's grace through Christ, Edwards was freed by God to explore the countless questions in his heart as well as God's matchless beauty, for pastors, theologians, lay persons, and others have benefited from centuries since. 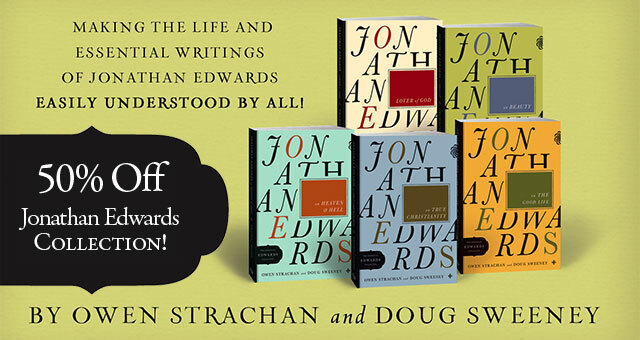 This essential collection taps into various aspects of Edwards thought and life. Much will be new and uncharted territory for those who have only been exposed to the five minutes Edwards receives in high school American histor reading out-of-context excerpts of Sinners in the Hands of an Angry God. Beauty was not a concept one could abstract from God, but was the very essence of God. Thus the realm God created displayed His beauty. Creation derived not from pragmatics, from a mere desire by the Creator to create. Creation existed because God desired to put His glory, His beauty, before a celestial audience. Other titles include Edwards on the love of God, the good life, true Christianity, and Heaven and Hell. Endorsed by pastors such as John Piper and theologians like D.A. Carson, this Edwards collection is essential in every sense of the term. At 50% off it's both a can't miss and a must buy.